This playground is named for the surrounding neighborhood of Auburndale. The earliest known inhabitants of Auburndale were the Matinecock Native Americans, a tribe of the Algonquin nation. The name Matinecock, meaning “hilly country,” described the surrounding landscape. In 1639, Dutch Governor William Kieft purchased the land that today encompasses Queens County from the Matinecock. The area remained largely agricultural until 1901, when the New England Development and Improvement Company bought 90 acres of farmland from Thomas Willet, whose family had held title to the land for more than 150 years. The Willet parcel became part of Auburndale. The name is derived from Auburn, Massachusetts, the hometown of Lewis H. Green, president of the land development company. The railroad reached Auburndale in 1901, whisking commuters to Manhattan in 17 minutes. In 1925, Charles V. Bossert bought seven farms and formed Treasureland Homes Corporation, building more houses; thereafter, the name “Treasureland” became associated with the area. The name Auburndale became official in the 1930s, when supporters of a new branch library demanded that it be given the name Auburndale Library. Auburndale Playground, jointly operated by Parks and the Board of Education, opened on May 3, 1962. 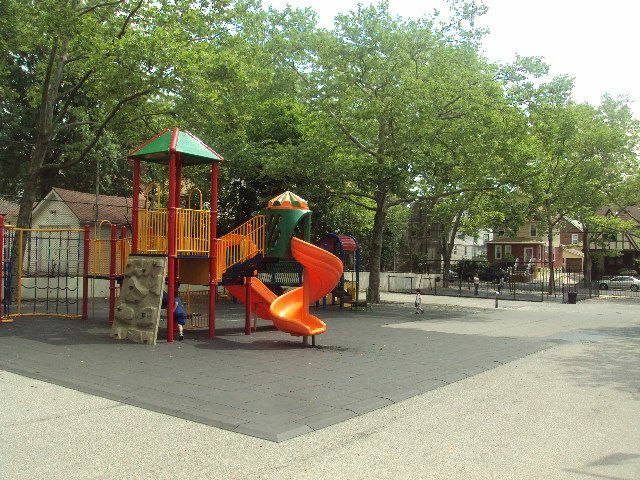 Located on 35th Avenue between 171st and 172nd Streets, the playground was originally named P.S. 32 Playground for adjacent P.S. 32, the State Street School. In 1987, Parks changed its name to Auburndale Playground. Today, the playground contains swings, a large play unit, a mini play unit, an elephant play sculpture, two full basketball courts, a spray shower, a comfort station, a sitting area, and a flagpole with a yardarm. London planetrees (Platanus x acerifola), known for their ability to survive harsh urban environments, ring the playground.